Brunelleschi's Dome history began in 1419 - there was a competition to design a new dome to the Florence Cathedral. The two most important competitors were Lorenzo Ghiberti (famous for his work in Gates of Paradise" in the baptistry) and Filippo Brunelleschi. An anonymous architect of the era even suggests that the cathedral was filled with soil before lifting the dome in order to build the dome shaped above ground. The idea of Brunelleschi to crown the dome with a large flashlight was put in doubt, resulting in another competition for the award. His competitors were Cachieri and Antonio Lorenzo Ghiberti, but Brunelleschi was the winner. His design was for an octagonal lantern with eight flying buttresses and eight arched windows (now on display in the Museum of the Opera del Duomo). The construction of the torch began a few months before his death in 1446. Its construction was slowed for 25 years without progress, due to the interventions made by several architects. 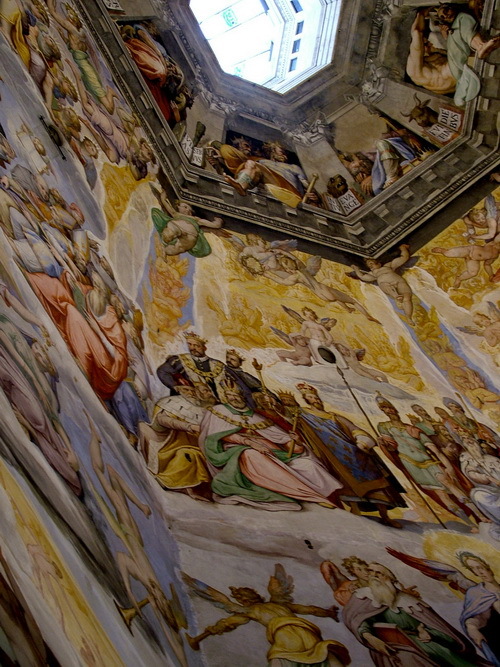 His friend Michelozzo finally completed the construction in 1461. The conical roof, was topped by Verrocchio in 1469, with a layer of copper and a cross containing relics. It used a crane specially designed by Leonardo da Vinci. The later structure has a total height of 114.50 meters between the dome and the lantern. The cover of copper was hit by lightning on July 17, 1600 and fell. There is a round plaque below the dome that marks the spot where it landed. Another, even bigger, replaced it two years later. The dome of Florence has not suffered any major restorations since then, and it is one of the monuments that since its construction, has been regarded as perfect. The decoration of the drum in the gallery, made by Baccio d'Agnolo, was never finished. WHy? Because Michelangelo was asked what he thought of it, and he famously is remembered as saying that the decoration looked like a cricket's cage. Famous by that time, his opinion was taken quite seriously and worked was stopped to reconsider what to do. It was never completed and by this point, it is same to assume it never will. Thus, with the topping of the the roof, Verrocchio finally completed the construction of the cathedral, started in 1296 following Arnolfo di Cambio's design, in 1469. A huge statue of Brunelleschi is now erected outside the Palazzo dei Canonici in the Piazza del Duomo, looking thoughtfully at his work, the dome that always dominates the landscape of Florence, the forerunner of many architectural achievements. Here you can find out more about Brunelleschi's Dome or Visiting Florence and Brunelleschi's Dome. You can also find accomodation following this link: Book a Hotel in Florence Dome. And on this page you can find some Florence and Brunelleschi's Dome pictures.